I’ve been thinking about what I wanted to say for this post, perhaps something profound about growing our own foods and sharing them with others, or this being the second anniversary of Grow Your Own and how the event has evolved, but each month I come back to the same theme: how much fun it is to see what everyone is growing, hunting, foraging, and making. 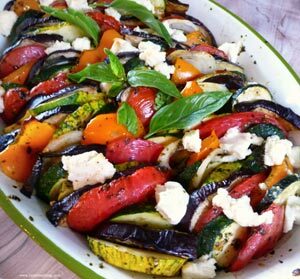 I always find ideas for new things to grow in your posts, and even though we may have some of the same foods in season, there is always a variety of dishes. I hope you find the posts as inspiring as I do. Thanks to everyone who posted for the second anniversary of Grow Your Own! We had eleven thirteen participants from three four countries, and we cooked with our homegrown tomatoes, basil, methi, peppers, squash, onions, greens, pears, and lemon verbena. If I missed a post, please let me know. If you are new to Grow Your Own, visit the Grow Your Own page to learn more about the event. Today we start the next event and our host is Praveen of Masala Heaven. The deadline for posting is September 15, so be sure to check Praveen’s blog for more information. We hope you will join us! Lynda’s tian is colorful and beautiful with her homegrown heirloom tomatoes and basil (recipe from Côté Sud). 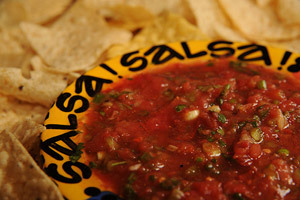 Donna plays Salsa Fairy (explained in her post) and shares a recipe for her favorite smoky salsa with homegrown tomatoes. 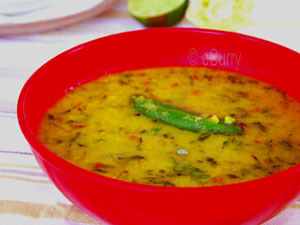 Soma’s dal is even more delicious with her homegrown methi and tomatoes. 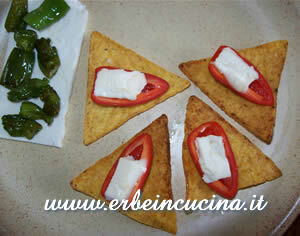 Graziana’s appetizers get their spiciness from her homegrown hot peppers. 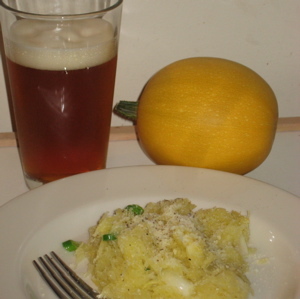 Chris’s spaghetti squash, onions, and peppers came together for a completely homegrown meal. 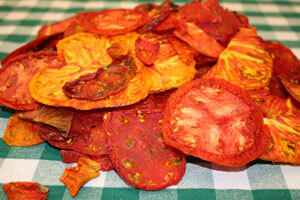 Linda shared the varieties of tomatoes they grew this year and the different ways they have used them. 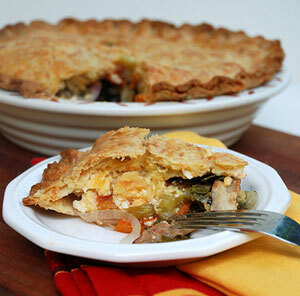 Homegrown tomatoes and greens make up part of the layers in this luscious bacon, lettuce and tomato pie. 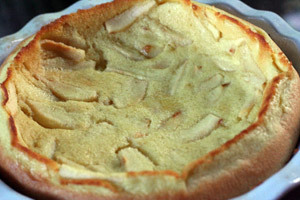 Amy’s baby pear tree has shared lots of fruit and some of it went into this custard pie reminiscent of a Dutch Baby. 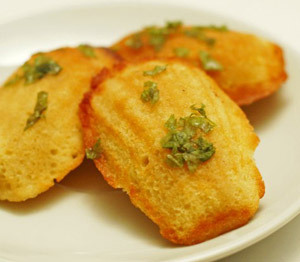 These lemony madelines (recipe from David Lebovitz) make a delicious treat. 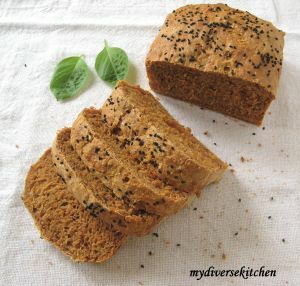 Aparna’s homegrown basil adds flavor to this beautiful tomato bread (recipe from Beth Hensperger). 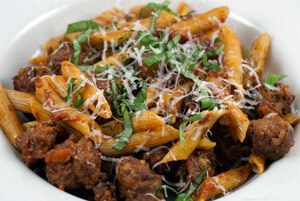 Jeff’s roasted his fresh homegrown tomatoes and added some of his fresh herbs to make this hearty pasta dish. Roasted Squash Blossoms with Tri-Color Filling from Sarah of What Smells So Good? 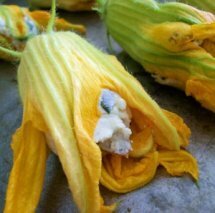 Sarah’s homegrown squash blossoms are sure to please with the homegrown sun-dried tomato, basil, and goat cheese filling. 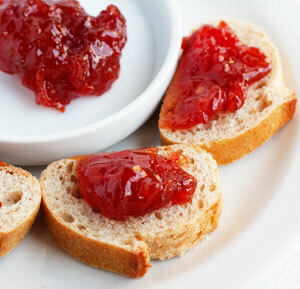 I used our homegrown Cherokee Purple heirloom tomatoes to make this Portuguese jam with port (recipe from David Leite). Congrats on 2 years Andrea! It really is a great event!!! What a beautiful roundup! Congrats, Andrea! What a great collection of dishes, I wish we could all share them together at a potluck 🙂 Congrats again on 2 years! Great round up. and congrats on 2 years. Thanks for starting, and continuing, GYO. Congrats on two years! There some really interesting recipes here. I am looking forward to many more “start at home” recipes in the months ahead.